Sometimes I needed an external serial monitor like the Serial Monitor in the Arduino Editor, to see what is going on. So I made one. The first picture shows an example how could be it designed. For the ESM I used an Atmel Atmega328 (based on the Arduino-Board) because it have an internal SRAM with 2KBytes. It’s necessary for the big data processing. So you need more than 1KByte SRAM. 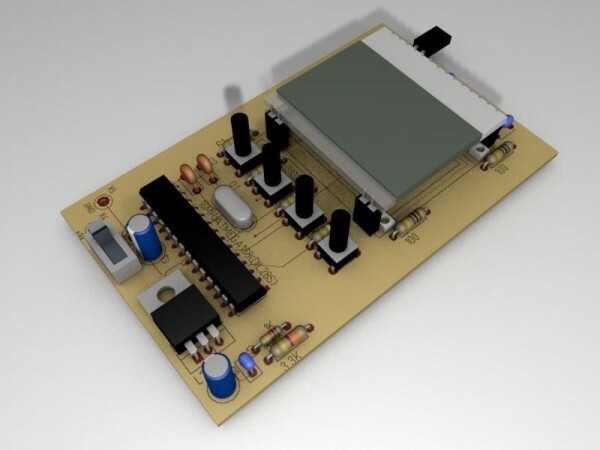 This entry was posted on Friday, April 11th, 2014 at 11:10 pm	and is filed under Arduino, DIY. You can follow any responses to this entry through the RSS 2.0 feed. You can skip to the end and leave a response. Pinging is currently not allowed. Anyone know of a 4.3 inch monochrome LCD, with 800×480 resolution? Touch screen not required. I’ve been doing something similar using my Galaxy S3 with USB-OTG hooked up to a usb serial adapter and a program called “Free USB Serial Term”. Actually 800×480 is overkill for most debugging. For me, a 96×64 (16×8 lines) Nokia 1100 or 1202 LCD is a huge improvement over a 16×2 alphanumeric LCD. Plus a small monochrome LCD will only take maybe 100-200uA of power, while a 800×480 will use a lot of power. I asked for 4.3″ because that’s mobile phone [iPhone?] size. 800×480 helps smooth fonts, increase legibility. My eyes aren’t so young – I need a bigger screen to read comfortably. Restricting to mono would keep power down, and limit the RAM required to about 47KBytes. Sticking with Atmel? I’d consider the AT32UC3A1256 [or 3128]. Once you leave monochrome, youll need a different chip – or external RAM. That is sensible… there are 5in and 5+in TFT color panels from China/HK with MCU interface, but they can cost as much as a second-hand LCD monitor… There is Pixel Qi, part mono, dunno if they are still selling, but I think the interface is RGB, more difficult to work with. Another panel tech that might be better than a mono panel is an e-ink display, which has better contrast in varied lighting conditions. Seeed Studio has/had a couple of e-ink panel sizes (saw a 2in just now) and an interface board. I dunno if they are big enough for your use… but I have talked before to the suppliers (Pervasive Displays) and they have panels up to 4.4in. Before I forget, here’s another idea… there are also plenty of e-ink boards on Alibaba that are supposed to be used for e-book devices, and there are driver chips being mentioned, but I’ve never seen any data sheets for the driver chips published online, or anyone tackling the task of interfacing to these boards. Just a thought.